Tomorrow some of the Enough team will travel to Catalonia again. They will produce independent on the ground reports about the situation in Catalonia. Last night 2 key figures of the pro-independence movement were imprisoned by the Spanish state, answered with massive protests across Catalonia. On Thursday another ultimatum by the Spanish state will end and could heat up the growing tensions between the cenral government in Madrid and the independentistas in Catalonia. A critique about a video that went viral. 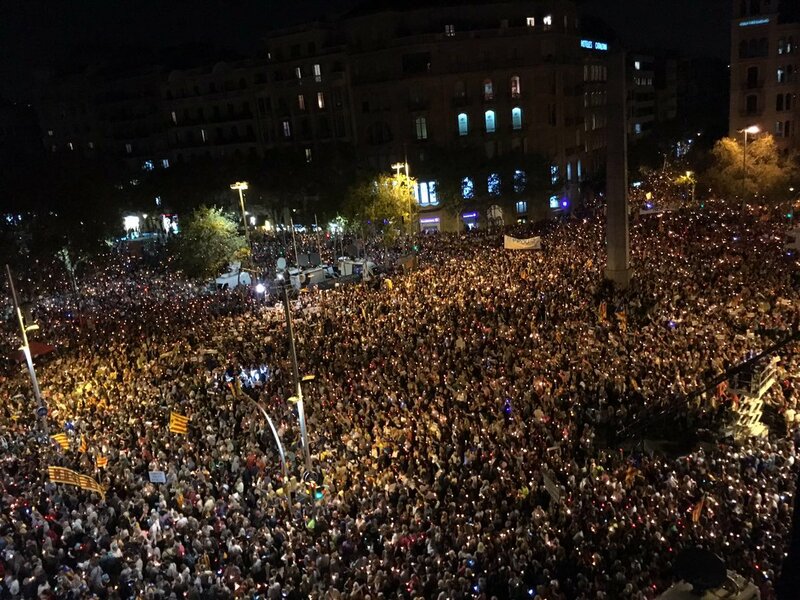 Image: Massive demonstration Barcelona tonight. Protesters are demanding the release of imprisoned key figures of the idependence movement that were imprisoned by the Spanish state yesterday. Image by Twitter account @asj_dasilva. Tomorrow some of the Enough team will travel to Catalonia again. They will produce independent on the ground reports about the situation in Catalonia. Last night 2 key figures of the pro-independence movement were imprisoned by the Spanish state, answered with massive protests across Catalonia. On Thursday another ultimatum by the Spanish state will end and could heat up the growing tensions between the cenral government in Madrid and the independentistas in Catalonia. After the Spanish state imprisoned Jordi Cuixart and Jordi Sànchez yesterday, massive protests popped up across Catalonia. The protests continued today with a short work and school stoppage at noon and massive demonstrations tonight. This brings us to the question: how naive are the people who produced this video or are they misleading people? Jordi Cuixart and Jordi Sànchez are not the first political prisoners in the European Union and they will not be the last ones. Cracking down protests is something which happens regularly in EU memeber states. Days before the first stone was thrown during the NoG20 protests in Hamburg, thousands of cops were surpressing any kind of protest in the German harbour city. 18 year old Fabio is one of the NoG20 prisoners. He is imprisoned since early July because the judge stated that Fabio has “destructive tendencies” and a “substantial deficiency of social and educational competence”. Fabio and both Jordi’s from Catalonia are just 3 of many political prisoners in the European Union. When it comes to human rights, the European Union also hasn’t a good reputation. Tens of thousands of people seeking refuge drowned at the EU borders. People who try to save lives at sea are facing repression by EU member states. The refugees that manage to arrive in the European Union are often subject to police violence, show trials, detention and illegal pushbacks. The European Union also hasn’t a good reputation when it comes to referendums. After people voted against the EU Lisbon treaty in a referendum in Ireland in 2008, they had to vote again in October 2009. The European Union pushed hard for the second referendum in Ireland to make sure the Lisbon treaty could be implemented. After people in Greece voted against the Troika cuts in the famous OXI referendum, the European Union have used methods that remind us of old maffia movies to put pressure on the Greek Syriza government to ignore the results of the referendum. And the Greek goverment did ignore the results of the OXI referendum. We could publish an endless list of acts against democracy and against human- and social rights by the European Union and its member states. So what do people who produce videos with European Union flags in it actually expect from this neoliberal machine? In our more detailed statement from September 30, we already stated that we are not exactly enthousiastic about states and nations. Not about new states and not about old states. For us social struggle and the struggle for a society free of hierarchy with equal rights for all is a priority. We know that many leftwing people are active in the independence movement in Catalonia. We also know that many of them share our views about the policies of the European Union and would never ever produce a video with EU flags while speaking about “European values”. Among anarchists there is still a division between those who support the independent movement and those who oppose the creation of a Catalan state. Most anarchists in Catalonia agree to fight repression, also the repression against the independence movement. Anarchists that are active in the independence movement often say their objective is to destroy the central Spanish state. They often have no illusions about a new Catalan state, but argue that a new Catalan state will weaken the deeply Francoist and fascist Spanish state. They also try to bring the self-organisation of people on a higher level in order to create preconditions for autonomy on the Catalan territory. We are not to optimistic about that, but also have to admit that we are also not optimistic about achieving these objectives in the current central Spanish state. Tomorrow we will travel to Catalonia again and speak with many comrades. We will produce independent reports about the situation in Catalonia and need your support to be able to do that. #Catalonia: Fundamental Social Change is Far Away | Enough is Enough!